It never fails to surprise me the many and varied ways in which my customers manage to challenge my skills and the capability of my lathe. Strangely, like those proverbial buses, these challenges don't come spread evenly throughout the year, but all in a cluster. In fact, all last month it seems! Luckily I enjoy a challenge and now, armed with a lathe that will handle almost anything that even my most imaginative customer can come up with, it is just a test of my skills. Last month saw me challenged in the form of a large bowl in some beautiful burr oak (Quercus robur), possibly the world's longest walking cane, some tiny chair components and I even became a segmented turner - sort of. I don't think Dennis Keeling has much to worry about, though! This was in addition to my usual walking canes, stair spindles and finials. 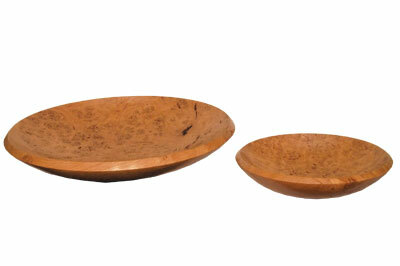 The first of my challenges came in the form of a pair of burr oak (Quercus robur) bowls. A chap rang and asked if I could turn them from a board he had bought some time ago. Of course, I agreed. When people bring in their own wood you never quite know what to expect. As it was, this guy had been a furniture maker in a previous life and so had an eye for a nice piece of wood. In truth, I've never seen a piece of wood quite like the bit he brought in that day. He left me with a sketch of the bowl shape he was after - a simple curve with a square edge. You might just about be able to see his sketch on the wall behind the lathe in the main photo on the previous page. burrs with very little clear wood at all. He explained that he had picked it up at a wood fair some time ago and although the board was marked up at Â£75, it was at the end of the day and he had paid £10 for it. Why do I never have luck like that? He asked me to make two bowls - one as big as possible, avoiding the splits and sapwood - and the other whatever size I could from the remaining timber. I managed one at 460mm (18in) and the other at 305mm (12in). Over the years I have turned a lot of bowls but never many of any real size; the biggest being an elm (Ulmus procera) platter I had made several years ago. This hadn't been much fun, working with the headstock of my old Jet turned and the lathe wriggling around all over the place. 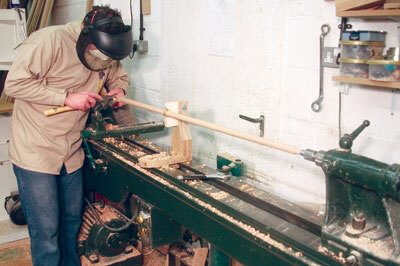 On the Wadkin lathe, however, it was a much more pleasant experience. To turn 460mm (18in) I needed to remove the gap bed section of the lathe; this would enable me to turn up to a maximum of 710mm (28in). To achieve the best curve I was looking for I used a trick I had picked up from another turner in a demo. By flexing a steel ruler you can achieve a perfect curve; by transferring this onto the bowl you should get a lovely shape to a bowl. I think the curve looks pretty good. Both the customer and I were pleased with the end result. The air dried oak turned beautifully and they were finished with multiple coats of hard wax oil to show off the grain and leave a lovely glow to the wood. 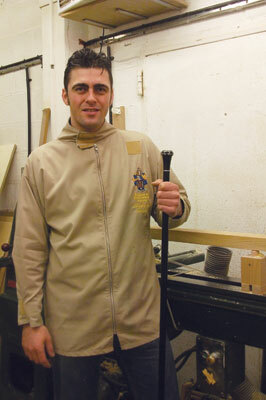 I have talked before about the walking canes that I regularly make for my Gothic customer. Over the last four and a half years I have made something in the region of 900, so I have had plenty of practice with making them. From time to time, however, I get asked for a special, which might be a little longer for the taller Gothic gentleman, or of a different diameter for a special top. When the call for this one came through, neither myself nor my customer could guess the reason for it, but my price went in and it was accepted. The request was for a cane, to fit one of the standard tops. It measured 21mm (3/4in) at the top, tapering to an 18mm (23/32in) ferrule at the base, but rather than the standard 900mm (35 3/8in), this one was to be 1,500mm (59in) long! With all the walking canes and stair spindles that I make, I have plenty of experience of long, thin turning but this was a whole different ball game. Usually I can get away without a centre steady but for this I needed one. I had fashioned a makeshift steady previously for the Jet but I hadn't yet got round to making one for the Wadkin, so I set to it, basing the design on one I had seen on my visit to Gary Rance's workshop. With the steady set up I got the cane turned. Progress was slow as I got used to using the steady and adjusting my technique to suit the new set up. This is the draw back to only turning one item; with multiples you get quicker and more efficient each time but with one, it just takes as long as it takes - in this case around an hour and a half - rather than the more usual 15 minutes for a standard cane. I don't have the patience for chopping bits of wood up and gluing them together to make something else; the closest I normally come to this is laminating several layers to form a bigger, solid lump of wood. A customer came to me with a diagram of a shop display for Whisky bottles; these were made up of a round base for the bottle and a stylised barrel standing vertically behind them. The barrel was to be made from oak staves, much like the real thing. After some thought I decided that my equipment isn't really right for cutting the very accurate angles required to form the barrels, as my machinery is set up to make wood either square or round, so I contacted another customer of mine; in fact, the guy I am turning those fluted softwood stair spindles for. He had said in passing that, should I need any machining doing, to give him a call. 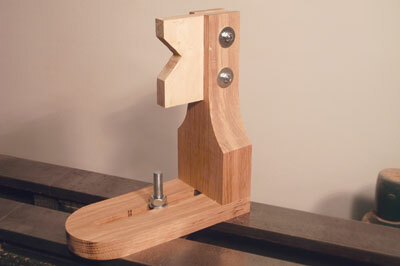 In his workshop he has what is known as a four-cutter, which is essentially a large planer/thicknesser but with four cutter blocks, so you feed an oversized square blank in at one end and a perfectly smooth and shaped piece comes out the other. 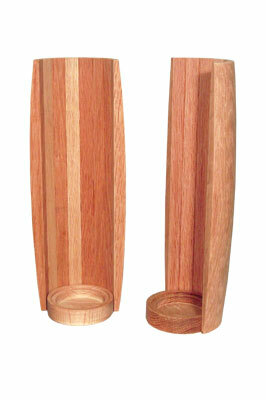 In this case it came out with a flat top and bottom with two correctly angled sides which would form the barrel staves. He also glued them up into barrels for me which meant all I had to do was mount them on the lathe, turn them to shape and cut them in half ready to present the bottles. I turned two large bungs for the ends of the barrels which allowed me to mount them between centres and turn them like standard spindles. Once turned and sanded, I ran them through the bandsaw, pushed each one over the planer and they were ready to go. After reading so much about the great capacity of my Wadkin lathe, you'd be forgiven for thinking that it can only turn large scale work - but of course this is not the case. In fact, a commission recently came in to turn a large selection of components for a guy who was restoring a pair of Middle Eastern antique chairs. 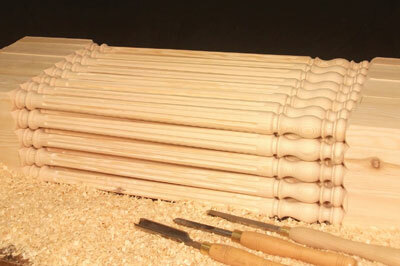 The beech (Fagus sylvatica) components were varied, including four feet, seven finials, nine ball strings for the back detail and 20 gallery spindles, these being only 90mm (3 1/2in) long and 15mm (9/16in) diameter. Small components can be as challenging, if not more so, than large work at times; with their tiny details, the finish still needs to be as sharp and crisp as any other piece of work that leaves the workshop. The large job for the fluted spindles continued and I decided that perhaps a good photograph of these would make for a better picture for my website logo than the bowl that had been there since I originally designed it. The old photo showed a bowl in a bed of shavings which I had been particularly proud of. The thing is, I don't make that many bowls so it seemed to be less relevant than a similar photo of spindles, so once I had turned this last batch of 40, I went about setting up the shot. Now, I'm no David Bailey but I think I can take an OK photo - and I liked the style of the previous one - so I laid out my large black cloth and set the spindles out in neat rows with the best faces looking out. 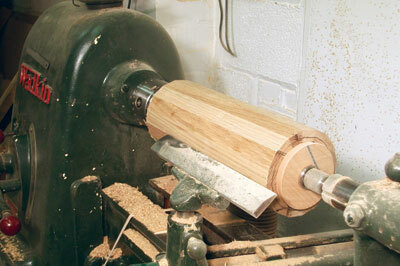 I then scattered a load of shavings around the base and positioned my spindle turning tools. I took a selection of photos, adjusting the layout several times and the outcome was pretty much as I hoped for. This is now the headshot for my website which seems to me much more relevant.